Earlier this year we showed you an unusual phone that’s been developed by a Germany-based startup called Blloc. 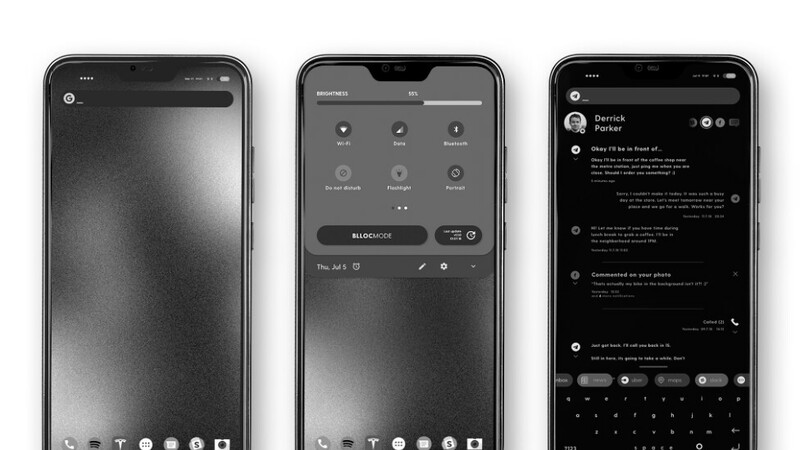 The phone stood out with its heavily modified Android skin that has a very minimalistic design and removes all colors besides black, white, gray and all of its shades. It appears that the Zero 18 has made it to the production line, but not without receiving some major changes along the way. If you remember our previous article (or checked it out just now), you’ll notice that the device shown there has little resemblance to the one you’re seeing at the beginning of this article. The Blloc phone’s design received the full 2018 treatment: a notch, slim, but noticeable chin, curved display edges and an iPhone X-styled camera bump on the back. Many will probably be disappointed that a new company that’s looking to stand out from the crowd with some unusual decisions went for such an overused design for its phone. What hasn’t changed is Blloc’s commitment to create a productivity focused, no-nonsense phone. To achieved that, the company’s Blloc OS (not the best name for the UK market, I might add) includes different modes that you can activate and get a more streamlined experience. Everything you need from your apps gathered in one place and easy to interact with. It’s hard to judge how well that would work from the website’s short demos, but we can see how it might appeal to some users. And of course, the monochromatic user interface design is still present as well. The purpose of that boring color scheme is to make you use your phone as little as possible, the same idea that’s behind the other software implementations. Of course, there are times when colors are necessary, so Blloc OS has a quick way to turn on full color mode at any time: tapping the fingerprint sensor. Internally, there are hardly any changes as well, besides the battery going down to 3,000mAh, the rest of the specs remain the same: Helio P23 chipset, 4GB of RAM, 64GB of storage, USB Type-C with fast charging and our good old friend – the headphone jack. The main camera sports a Sony IMX258 sensor, which should be enough for some decent looking photos. Considering the purpose of this phone is to not be used much, Blloc seems to have chosen the right set of components. You might not be impressed by the specs, but at least the price is on par with them: 359 Euro ($411), but that includes VAT and shipping. If we strip the VAT, we get a very acceptable price of around $350. The thing is, it will ship only to a few European countries when deliveries start in November. However, the device does support all major US carriers’ bands and should work just fine if you happen to get your hands on one. I love both the look and purpose behind this phone. I hope it's sold in the US. if not. how can we get this UI?